Florida, the place of sunshine, warm weather, sunny beaches, mild winters as well as much deserved vacations. In spite of all these good qualities, Florida residents spent quite a significant amount of money trying to cool down from the hot tropical temperatures. Air conditioning units are usually cranked up in an effort to lower the temperature around the house. However, to counter the heat most people are turning to the green solution, well relatively green solutions. Recent day scientific studies have revealed that planting trees in proximity to your home not only increases your privacy and demarcates boundaries, but it also create a cool refreshing atmosphere around your house; a phenomenon that has been found to reduce the heating bills by a third. Trees have been found to reduce significantly the ambient temperature creating a coveted cool, serene ambiance; especially if present in large numbers. However, most people are skeptical about planting trees close to their house premised on the fear that trees can damage their sidings or even fall on their roofs. 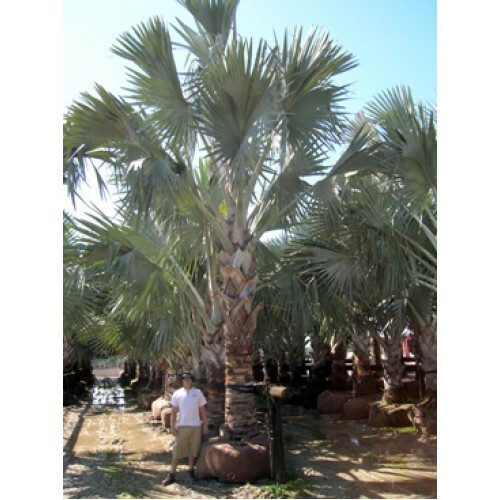 At aqualityplant.com, the home of wholesale palm trees Florida, we offer an alternate solution to your needs – palm trees. In addition to the official state tree of Florida the Sabal Palmetto, we offer a great variety of different sized, fast growing palm trees to meet all your needs. Palm tree types such as the Sago or the Silver Date Palm do not branch out and are relatively safe to grow next to your house. However, people seeking to establish a garden or line up their driveways are can settle for the Washingtonia or the Queen palm, some of the most popular species in Florida. In addition to creating that cool and serene atmosphere in your home, a well-landscaped garden planted with palm trees often increases the market value of the property. Palm tree easy to maintain, thrive in the tropical weather of Florida and relatively cheap maintenance compared to a front lawn planted with exotic grass variety. The two rainy season experience in Florida are sufficient to support the growth of the majority of trees available from the number wholesale palm trees Florida area suppliers. The high quality, fast growing varieties not only add a touch of beauty and class around your home but create an enabling environment for you to experience better quality of life. These majestic and unassuming plants have been credited with improving the road safety in and around Florida by clearly demarcating the road and street boundaries. Additionally palm tree is relatively litter free, as they do not shed their leaves, unlike other tree varieties. Occasionally, palm trees do shed their fronds but the effort required to pick up the fallen fronds cannot be comparable to the energies required to rake up leaves in the middle of summer. Additionally, palm trees can be planted right next to your pool as they do not drop their fronds into the pool. A great variety is available from us at A Quality Plant your top wholesale palm tree Florida supplier can help you create a unique and colorful boundary around your pool area. This would ensure privacy as well as a fresh and beautiful pool ambiance.